If you’ve driven through Susanville this winter, there have been plenty of reasons to slow down. With the melting of the snow, days of rain accumulation and remnants of roadwork, Susanville’s roads are looking a little rougher than usual. Finishing most culverts, sidewalks and water mains, Caltrans, the city of Susanville and other entities worked steadily through the year with several projects throughout town and outside the city limits. But being in the dead of winter, the road quality is diminishing at a fast pace without new street paving. Even though the Main Street’s paving will start in the late spring, roads are wrought with puddles, and only knowing by personal experience may tell you which puddles contain potholes. Heading toward Uptown on Main Street in the right lane, between McDow Street and Grand Avenue, (and even from Fair Drive to Fairfield Avenue) there are long stretches of potholes, sometimes feet across. At the intersection of Main and Ash streets, is also a huge collection of potholes, left from water main work and worn from traffic. It’s not just Main Street Susanville. Johnstonville Road, between Highway 395 and the Susanville Municipal Airport has been deteriorating for years, and halfway through the winter season many more potholes have become much worse. Specifically, potholes are depressions in a roadway that can range from a few inches wide and a few inches deep, to several feet wide and sometimes a foot deep. The city’s public works street department details expectations from potholes. 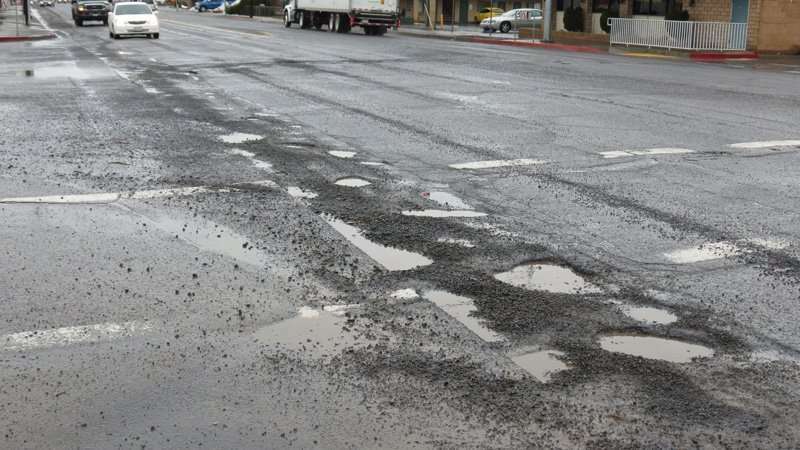 Since potholes form in both gravel and paved roads it is not a simple matter of rain washing the material away, and since rain falls equally on the entire road, the weathering effect should be equal over the whole surface. Another consideration is that potholes seem to appear in the spring. Furthermore, potholes can form in cold climates as well as hot climates only for different reasons. In colder climates, such as in Lassen County, the freezing and thawing of the road surface lifts the road material making cracks in the surface. Those cracks that formed then fill with water, which freezes and expands the cracks wider. The thawing water washes the broken material out of the cracks. Cars traveling the road hit the small cracks vibrating even more material loose from the area. As the holes continue to grow the bumping gets more severe, breaking more of the surface loose. As these breaks get wider the asphalt is able to rock loose leaving the pothole behind. In either climate, the pothole process is initiated by small breaks in the surface. Some are caused by freeze/thaw cycles and others are caused by asphalt drying out due to long-term sun exposure. The potholes continue to form from exposure to rain, ice and traffic. After time the original material becomes loosened and eventually fails completely — leaving behind the pothole. The street division repairs more than 180 potholes per year using everything from a hot patch truck to bagged asphalt and shovels, and its goal is to fix all potholes reported to us as soon as possible. Priority is given to potholes that may affect drivers, the rest are on a first come, first served basis. The streets division knows it cannot find all the potholes in the city, so it relies on the public to report potholes when they see them. To report a pothole to the city, call 257-1041.